God’s mercy is manifest in the life of David. Even though he was a “man after God’s own heart,” David knew the level of God’s mercy. Today’s devotion shows me another God’s character, showing His total provision for us. Psalm 23 shows us that mercy follows us all the days of our lives. As we journey through this life, we all have a tendency to fail, to be confused, to fall short. But as Psalm 94:18 points out, When I said, “My foot is slipping,” your unfailing love, Lord, supported me. When we fall, His mercy is there –it follows us and holds us up! No matter what the circumstances, no matter what the cause, if we are pursuing God’s will for our lives, His mercy will follow us all the days of our lives so when we do fall, it will hold us up! Father, Your Mercy is unsearchable, yet such a treasured gift! There are so many times I fall short of your glory, at hindi ko nasusunod yung mga naisin Mo para sa akin yet, Your Mercy is there to hold me up and set me back on my journey. Thank you for showing me Mercy when I deserve it the least, and thank You for reminding me that Mercy has everything to do with You, nothing whatsoever to do with me, what I do, where I go, or who I am, for I am nothing, absolutely nothing without You! Father God, be exalted above the Heaven and earth! For Your mercy is great and incomparable. Thank you for pursuing me, chasing me and following me through Your goodness and mercy. You are the God who is not hard to find. Don’t give up on me until the day that I will dwell in You forever. In Jesus Name Amen. Hello 2015! Hello Belle de Jour! As a busy and a queen of being ulyanin (forgetful) woman, it’s crucial to me to keep everything written down so I won’t forget all my schedules in the ministry, work and other daily-weekly-monthly affairs. As a blogger as well, I also keep my drafts by writing down a weekly lineup in one of the notes pages provided by the journal. So what better way to do that with a planner that is specially designed for women? Say hello to my Belle de Jour Power Planner for this 2015! This is a gift to me actually by Ate Cams (my dance ministry leader) and this is the first time that I’ll be using BDJ planner. 🙂 I’m soooo kilig! Hahaha. I saw what’s inside and it is super complete! All in one power planner. What’s inside the 2015 Belle de Jour Power Planner? Time Management Principles -Based Layout to help you get things done. Advocacy Tracker to challenge yourself to make a difference. Goals, Dreamboard, and Checklists to help you focus on what’s important. Health Checklist, Immunization and Menstrual Tracker Pages so you can take good care of yourself. Bills and Cash Flow Tracker Pages to help you manage your income and expenses. DREAM BOARD so you’ll be inspired! There is also an expandable back-pocket in this planner which I love for keeping things the basura in me and able to accumulate along the way of one year! 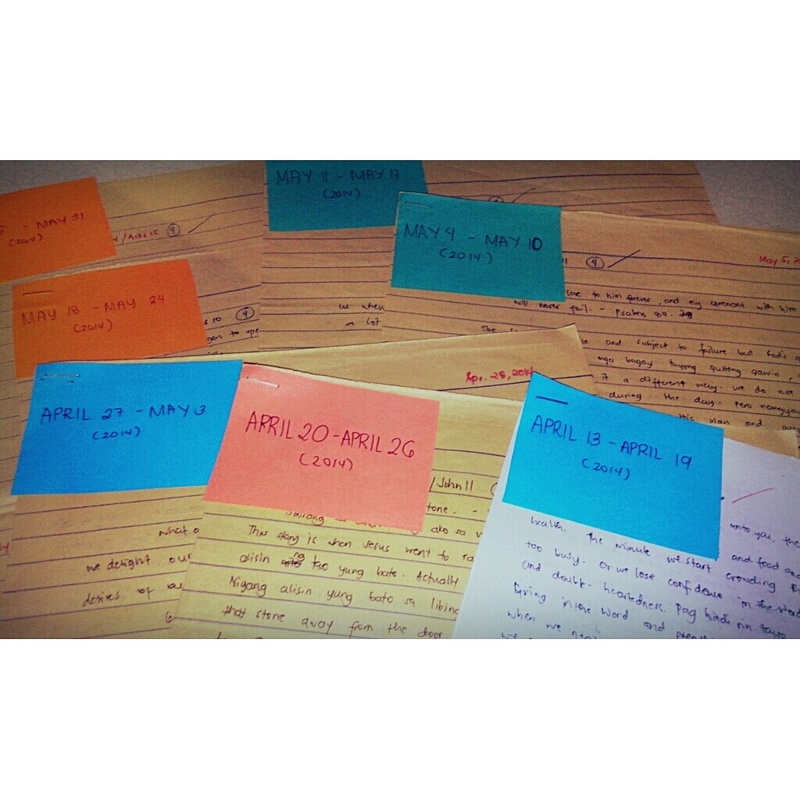 HAHAHA and tickers to mark special dates. Aside from the planner, there is a booklet that includes tons of coupons for you to enjoy! Plus a Lifestyle Card that really comes with the planner for you to enjoy discounts and promos all year! There is a list of establishments and stores where you can use this card. Before going to bed, natuwa akong basahin yung mga devotions ko from April to May at sobra akong na-amaze sa revelation ng Lord sakin nung April 21, 2014. I just want to share you on what God had taught me about this life. The story is about when Jesus went to raise Lazarus from the dead at sinabi Niya doon sa mga tao na alisin yung bato. Actually kaya naman ni Lord gawin yun mag-isa. Kaya Niyang alisin yung bato sa libingan ni Lazarus because we know that He is powerful but God revealed it to me that rolling that stone away from the door of the tomb are the things that those people can only do. They couldn’t raise Lazarus from the dead, but they could roll the stone away. How to apply this to our life? God expect us to do all we can and then He will do what we can’t. Matthew 7:7-8 said that “for everyone who asks receives and he who seeks finds and to Him who knocks, it will be opened”. Maybe 9 out of 10 doors we try are locked and we only going to find one open but we have got to do what we can. We can’t just sit there and say, “God revel it to me!” God expect us to put feet to our prayers to get out and do a little hoofing and look. If we are doing our best to please and obey God, He will do almost anything for us, some of the most amazing things we could possibly imagine! Father God in heaven, thank you for Your encouraging words. Please help me and the one who is reading this to remember the important message about doing what we can and then trusting You to do the rest. Help me to have faith in You but also the determination to do all we can and push forward! In Jesus, Amen.